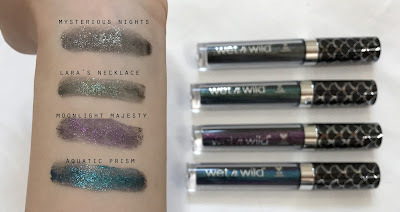 I'm so excited to finally have my hands on the new fall collection by Wet N Wild called Midnight Mermaid. The box is soooo pretty with the holographic mermaid and mermaid scales. I spent half an hour trying to check out on launch date because their website was so slow and there were probably a ton of people trying to get on the site too. But, they shipped it out relatively quickly. It's currently out of stock but you can get the items individually or at ulta/walgreens/drugstore. The box was $34.99 and most value for money though. The mermaid box came in a brown box (standard packaging) and the contents were bubble wrapped and sealed. So, pictured on top is how everything looks inside minus the packaging and seals. 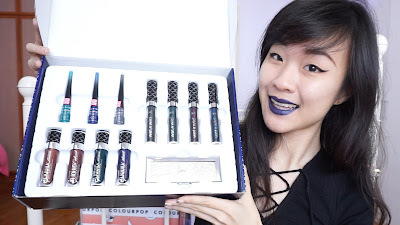 These are the MegaLiner Metallic Eyeliners. Individually, they retail for $3.99. There are three shades - Sea Symmetry, Sea Dreams and Trident's Shimmer. 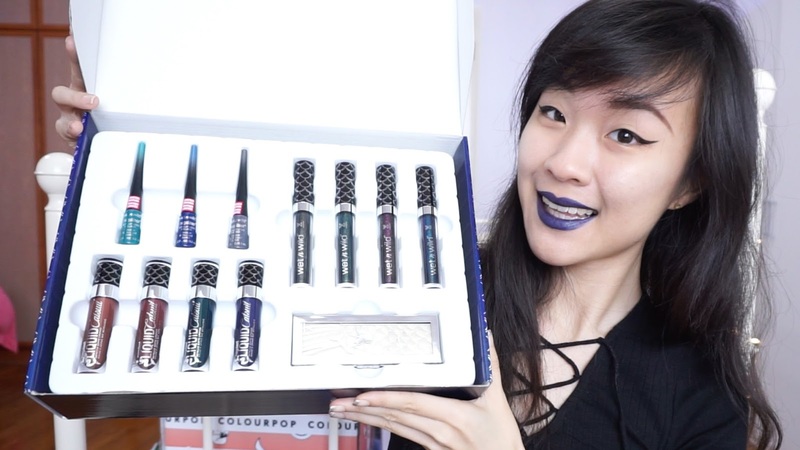 These are relatively pigmented, except for the blue one which is a tad patchy. The applicator is a standard skinny brush that is soft and comfortable to apply on the eyes. They are also waterproof once dry. This is my favorite color because it is such a vibrant teal and the metallic sheen gives it the perfect touch. I imagine this would look even better over a black base. This one is slightly patchy but you can go over it to intensify the color and fix any spots. It is quite wearable because it is a dark navy blue so it's not too far off from black. This is also another wearable shade because it is a dark grey. It's nice to use as a little shimmery touch to your liner if you don't want to stick to the plain black liner look. 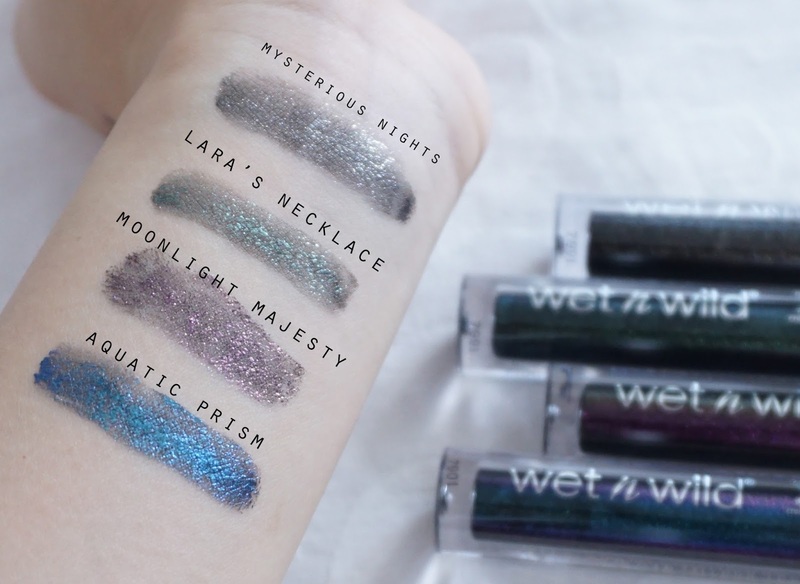 Something I was really excited about were the Color Icon Metallic Liquid Eyeshadows ($4.99) because these are dupes to the Black Moon Cosmetics Cosmic Eyedusts! 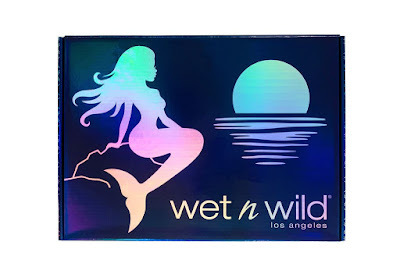 I know they are the originals and I feel kinda bad about it because Black Moon Cosmetics has gorgeous packaging and their formula is very innovative. However, because I have monolids, it isn't very easy for me to pull off dark eyeshadow all over my lids. I have no idea how to use these except as eyeliners. Most of them have a duochrome shift to it but it's not very obvious when you swatch or apply it on. Mysterious Nights has silver glitter and does not have a color shift to it. Lara's Necklace has green glitter with doses of blue and yellow shifting sparkle, although not obvious at all once it's out of the tube. Moonlight Majesty is a purple with a yellow shift. It was quite obvious on my finger that I used to blend it out with but on my arm, I couldn't really capture the shift. Aquatic Prism is a blue with purple shift. This is the most vibrant and pigmented shade. The shift is more obvious with this one. You can sort of see it in the picture above, but it's okay if you can't. You really need to see these in person. Next, we have a new highlighting bar called Midnight Moon and this retails for $6.99. It has a whole mermaid tail imprinted on it. This highlighter is an iridescent gold with purple glitter, but the purple glitter is quite sparse and chunky so it doesn't really translate easily and it doesn't show up much. I'm not too sure how I feel about the glitter because it can just look like glitter fall out. The highlighter has a dry and stiff texture in the pan so it doesn't pick up well with a fan brush. A denser brush might work better but I just went in with my fingers because that's the easiest. The highlighter does have a greyish base to it so piling on too much can cast a grey tone on your skin. I'd recommend to go in lightly because it isn't a flattering look to have that grey cast. Otherwise, this yellowy gold glow is nice if it's your color. I do think it looks best against deeper skin tones. It's far too light for my fair skin. The last few items are the MegaLast Metallic Liquid Catsuits. The matte ones are by far my favorite matte liquid lipstick formulas because they are so smooth to apply and comfortable on the lips. Plus, they are transfer proof and have a true matte finish to them. These retail for $4.99 and I highly recommend all of them. These metallic ones are not transfer proof but they only transfer minimally. They glide onto the lips and have a soft plush feeling to them. I think they are packed full of emollients because they feel really conditioning on the lips. The applicator is the same as the matte liquid catsuits - it is a doe foot with a dip in the center to scoop product and hug your lips. Lining your lips and filing them with this applicator is so easy! This is the most pigmented color of the lot. It applied evenly and it is such a gorgeous shade for fall. It's pretty wearable too. This one is ever so slightly patchy. A second layer will fix it but it looks pretty good even with one layer. This is another wearable shade for fall and it's so flattering on all skin tones. I've been so obsessed with such colors recently. This is a teal that leans more on the green side and it is absolutely gorgeous. I could do with some touchups but this is only one layer and it looks equally amazing. I honestly think that everyone would look good in this color too, if you dare to wear it. This final one is an indigo blue. The purple undertone makes it slightly more wearable and the fact that it is a darker shade makes it stand out less (if you're worried about it being too bright and blue). I really like this color too and I've been trying to rock blue lips more often. Overall, I really like the items in this collection. The only item that I didn't like very much is the highlighting bar. The formula is a little disappointing and the color isn't very nice on me. I highly recommend everything else though!